Supports MS Outlook 2016, 2013, 2010, 2007, 2003 (32 & 64 Bit) Versions. 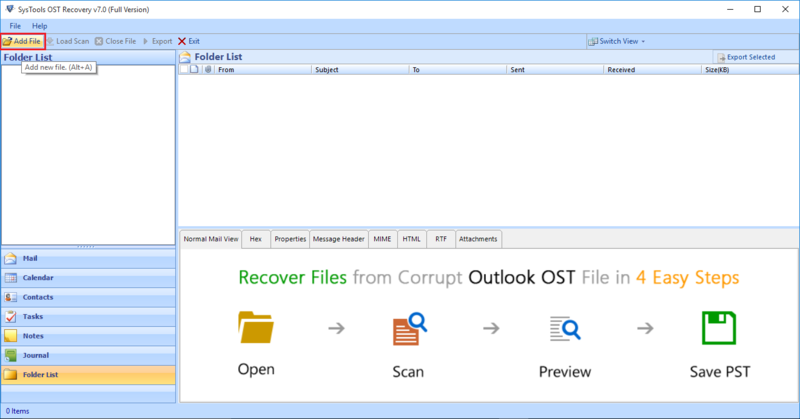 OST Recovery Tool helps you to rescue the email items such as Contact, Calendars, Notes, Journal, Task from the corrupted email files. 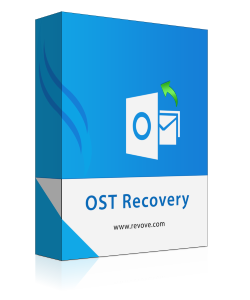 OST recovery software allows you to export the ost email items to pst/eml or msg formats. There is no limit to export ost file to pst and other formats.Thus providing you flexible option to view it on other email platforms. 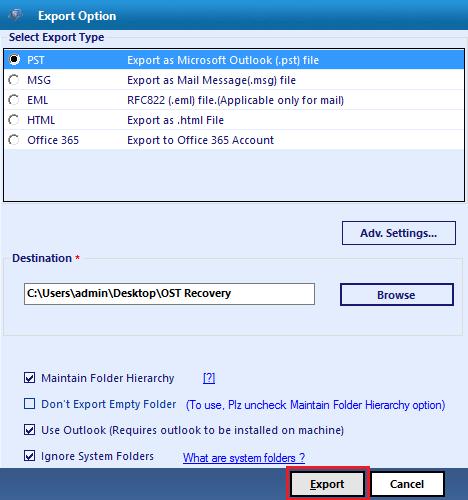 OST file is created when ms outlook is connected to the exchange server in cache exchange mode. OST file share common hash value with exchange server. Thus making the OST file encrypted. You cannot access ost file outside the limits of exchange server. In this situation, OST Recovery software can be very useful and productive. It allows you to preview Encrypted OST file with attachments and provides the flexible export option to save the recovered ost emails to pst. If the OST file has high level of corruption then advance recovery mode of ost recovery software can be prove useful to carved out the crucial information from ost file. With advance recovery mode you can easily retrieve hard deleted ost email files and files which are automatically deleted after the expiry of retention period or mistakenly deletion of delete folder. While Exporting recovered data, sometimes the user does not want to export unwanted emails and other file, then ost recovery tool allows the user to use the mail filter option. Using this filter you can select the desirable date range with From and To dates. 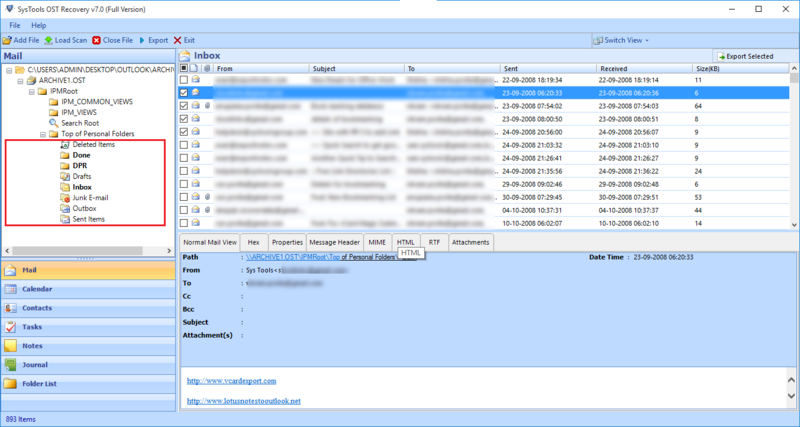 In this way, you can the save time to export unnecessarily ost emails, if you do not need them. OST Recovery Software instantly recovers the lost or missing ost file. After the successful recovery of ost email, you can easily export ost file to pst and other file formats. 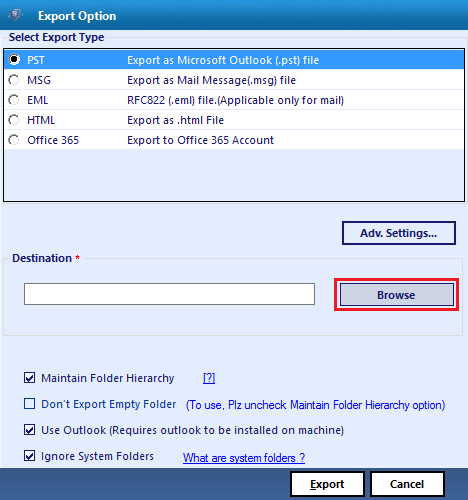 If you want to import converted ost file to MS Outlook then you can choose PST file option. This makes ost file data accessible in Outlook also. Step 4: Click on Export to start the process. Can I recover my permanently deleted or Hard Deleted ost file using OST Recovery Software? Yes,You can conveniently recover your hard or permanent deleted email using OST Recovery Tool. Do I need Exchange Server Environment to recover damaged ost file? No, There is no need of exchange server environment for recovery of damaged or corrupt ost files. It also supports encrypted or orphaned ost file as well. Does the OST Recovery Software enforces any file size limitation on OST File?